The Lake Superior Water Trail (LSWT) is a network of mapped access points and recreational resources along Wisconsin’s Lake Superior south shore. The water trail provides a framework for a wealth of environmental, historical, and cultural experiences accessible along the Lake Superior coastline. The LSWT consists of two segments: a 40-mile segment from the St. Louis River to Port Wing and a 30 mile segment from Ashland to the Montreal River at the Wisconsin-Michigan state line. The LSWT project represents the culmination of 3 years of work on behalf of a multi-organizational partnership involving state, federal, regional and tribal government, Wisconsin Coastal Management and the Inland Sea Society. 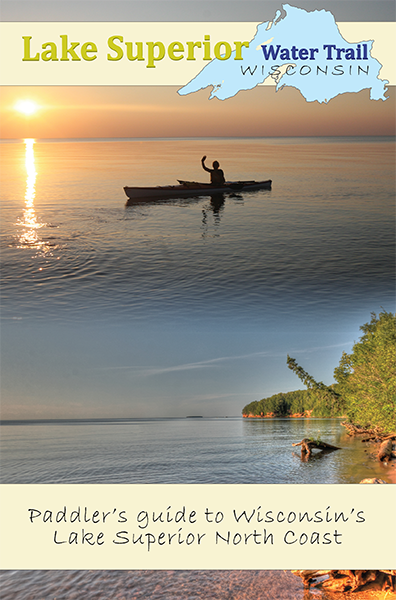 The Lake Superior Water Trail Guide provides detailed information along with tips and maps to aid in planning your next adventure to Wisconsin’s “North Coast”. The Water Trail is organized into 12 segments, each with its own distinct character, challenges and rewards. Paddlers of all abilities will find outings that will be well matched to their skills and interests. From sheltered bays and estuaries to breathtaking cliffs and sea caves, Wisconsin’s Lake Superior Water Trail offers something for everyone.